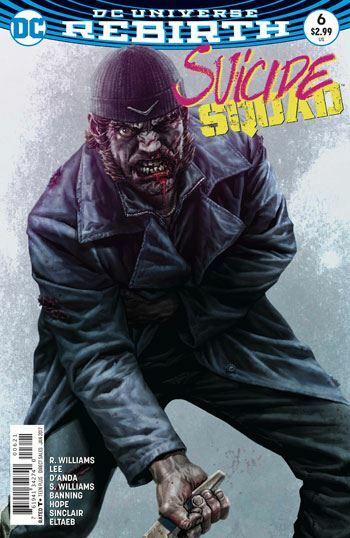 Rob Williams pulls off another great issue of Suicide Squad with number 6, which has the main team descend into chaos, as well as a Croc back-up tale. The story picks up from the exceptionally dramatic conclusion to the previous issue, in which Rick Flag shot Amanda Waller point blank. The opening here is only a bit of a cop out. Katana was fast enough to deflect the bullet with her sword, and even though we saw Amanda get shot at the end of the issue, that proved to be a hallucination Rick experienced. The black mass that General Zod emerged from is affecting all the people in Belle Reve, and not for the better. When a prison full of dangerous psychotics gets pushed over the edge, one is pretty much guaranteed an action packed fun fest, and Williams and Lee deliver on that. There is a follow up to the previous issue’s scene between Croc and the Enchantress, although things don’t play out quite as warm and cuddly as before. 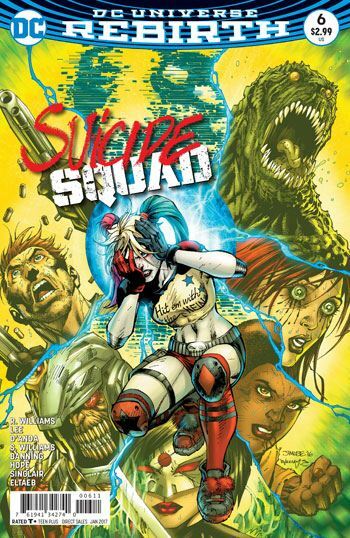 Hack gets visited by a decaying Captain Boomerang, but it’s Harley Quinn who once again gets to steal the show. While everyone else has been pushed to insanity, Harley has been shoved back the other way, and winds up the only sane one around as the issue comes to a close. The Croc back-up story continues the high quality of these pieces. Amanda tells Croc information she has learned about his past. While Croc likes to play the mindless beast, Amanda knows he is not, and we get a tragic tale from his childhood. The piece does not get maudlin or try to tug the heartstrings, and succeeds all the more for that.